In its edition of September 26 2014, The Cameroonian newspaper Le Quotidien de l’Economie, reported that Viettel’s request for an extension of its exclusivity on the provision of 3G services until 2016 has been turned down by the Cameroonian Government. The Agence de régulation des télécommunications (ART) has reportedly authorised MTN Cameroon and Orange Cameroon to offer 3G services from 2015, indicating that Viettel’s application to extend its monopoly was rejected. Granted in 2012, the monopoly over 3G infrastructure and services was put in place to allow the new player to catch up with its competitors in the broadband market, Viettel failed to deploy the 3G infrastructure and asked the Presidency for an extension of its monopoly until 2016. The regulated monopoly over 3G services had created a regulatory barrier for the development of fast and affordable broadband services in the country by the incumbent operators. For consumers, the widespread use of 3G to all operators can only be beneficial. The quality of services will evolve and prices will certainly decline due to a competitive market. In Central Africa, Cameroon will join the group of countries such as Chad and Gabon where 3G is already effective. Fear over the extended monopoly over 3G infrastructures and services was raised in the June 2014 policy brief on broadband prices and performance in Cameroon by Research ICT Africa. It brought to the Cameroonian Presidency’s attention that the growth of affordable and real broadband services were impeded by poor policy decisions in the country. RIA found out that in comparison to most African countries, Cameroon lagged behind in the deployment of 3G services due to protectionist policies, which granted Viettel a monopoly over 3G infrastructure and services and prevented the two other operators MTN Cameroon and Orange Cameroon from providing efficient mobile broadband services. 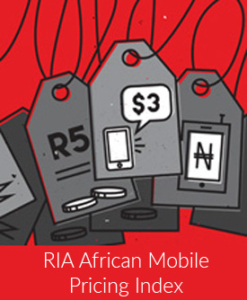 RIA research established that the policy outcome of the regulated monopoly over 3G services was not only high prices of mobile data but also the lowest throughput on the African continent, which did not go beyond 2.5G speeds. RIA policy brief recommended to the Agence de régulation des télécommunications (ART) the need to license the two incumbent mobile operators to provide 3G services in order to remedy this outcome.